Collecting design and home decor magazines just to look at decorative throw pillows, is an incurable habit I can’t break. I’m especially all over digital publications… FREE and just so much easier to save tons of ideas without cannibalizing the pages. 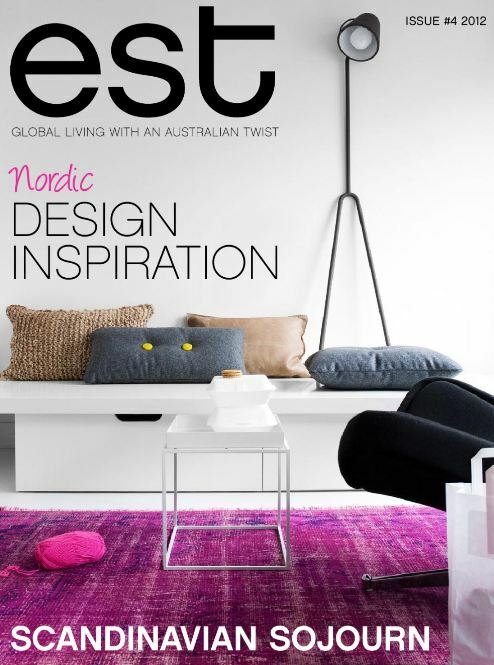 The latest edition of EST Magazine was released today and it’s had me totally absorbed! More than 40 of its 129 pages had some view of decorative throw pillows…. gorgeous designs and interesting arrangements. Equally interesting were the pages and pages of trend reports and their article on vintage – real or copycats. “Vintage originals are design de rigueu.. retro is the rebirth of cool”. That’s such good news because I’m still schlepping around “stuff ” that I grew up with. That means I’m cool too, right? Hmmm… I guess that makes my two vintage sisters, who are much, much older than I am, VERY COOL TOO. 🙂 Anyways, EST Magazine has great retro styling ideas worth checking out! Here’s a layering of 3 pillows… one square and the other 2 rectangular with one up on end. Standing pillows up on end, where the height is longer than the width, is a styling trend that we are seeing more of. Looks like there could be at lease 6 pillows on this sofa. 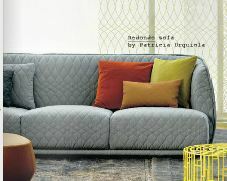 Complimentary, solid colored, knife-edged pillows inject some color and character in a quietly casual room. 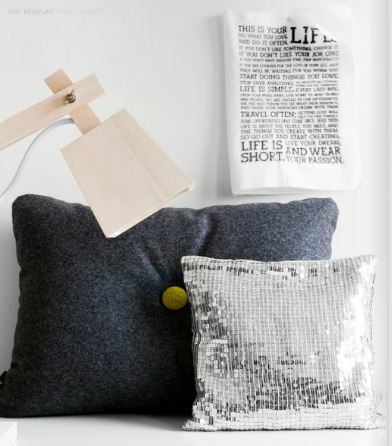 I love the contrast of this dark wool lumbar pillow next to the sequined square silver one. There should be more pillows with buttons! I love love pillows with buttons! Check out the fun black and white striped rug on page 60 and the black and white sofa on page 89. That explains why I ship a lot of black and white striped throw pillows to Australians! Put your feet up, you’re in for a good read. 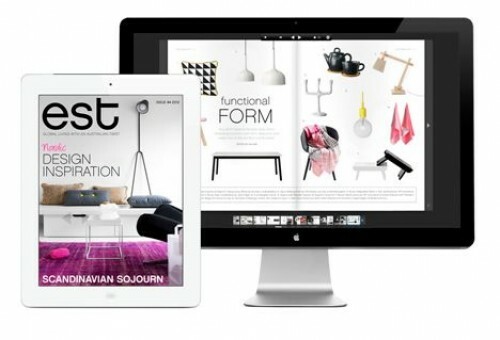 Subscribe to a good read at EST Magazine. Hi Kelly! Thanks for stopping by. There are a few more new ones I will be posting about shortly.